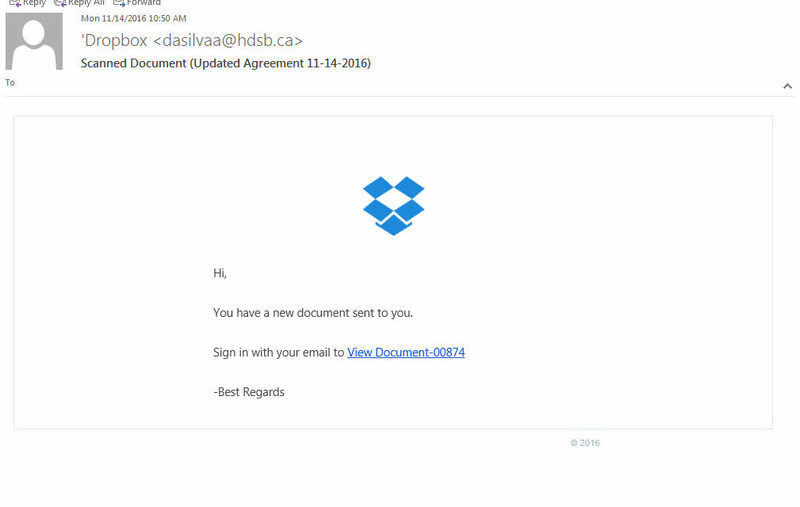 More attempts to fake us out with a “document” from “Dropbox”. A few quick things to note: From is hinky, Subject is general, but could fake you out. To is blank (big red flag). Hover over the link and you see the link has nothing to do with dropbox, but some poor schmuck’s site has been hacked, and he doesn’t know it (FYI, we let him know). As mentioned above, when we looked at the site that was being used for this phishing sham, we contacted them as it looked like a live site. The site owner responded and thanked us. Never pass up the chance to do a good deed.